INDIA: French President Francois Hollande made a fresh push Thursday to clinch the world’s biggest defence deal, the $12 billion sale of 126 warplanes to India, during his first visit to Asia since taking office. The Socialist president was accompanied by a high-powered delegation of five ministers including Foreign Minister Laurent Fabius and Defence Minister Jean-Yves Le Drian. The two-day visit by politicians and business leaders began in New Delhi and will see the delegation head south to India’s financial capital Mumbai on Friday. 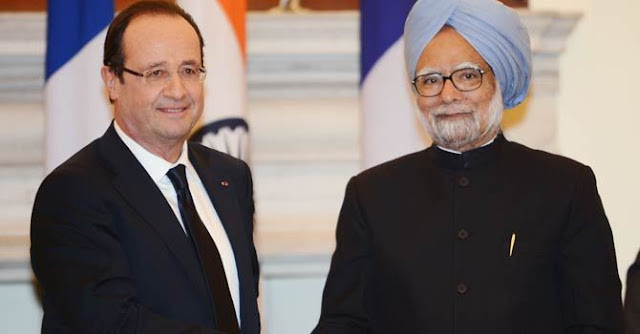 Speaking in English after being accorded a red carpet reception and gun salute at the residence of his Indian counterpart Pranab Mukherjee, Hollande said it was “a great honour for me and for France to visit India”. “I am sure that this visit will see our relationship at the best level we can hope,” Hollande said. “We come from a great partnership, India and France, and we must always improve the relationship between our two countries. “India is a great democracy, the biggest democracy of the world, a country which is developing and France must be with you in this challenge.” The trip is Hollande’s first to Asia since taking office in May and both Indian and French officials say the mission underscores the importance France attaches to ties with the world’s second-fastest growing major economy. “Our relations are growing fast in all sectors... in economic, industrial and commercial spheres,” an Indian foreign ministry official said, while cautioning against expecting any big-bang announcements from Hollande’s visit. Hollande is accompanied by a large contingent of French business leaders, including Dassault chief executive Eric Trappier, whose company is hoping to seal a deal to sell 126 Rafale warplanes to India in the world’s biggest defence contract currently under negotiation. The contract, which India’s airforce chief said last week could be signed by the middle of the year, featured prominently in Hollande’s talks with Indian Prime Minister Manmohan Singh which followed his meeting with Mukherjee.